A comparison between four ornamental and three wetland plants for their ability to remove pollutants from water identified the ornamental canna plant (Canna xgeneralis) as the winner. Pollutants like nitrogen and phosphorus promote the growth of microorganisms that usurp all the oxygen in the water leaving other aquatic life to fend for itself. Wetlands and retention ponds used traditionally to clean water bodies are unable to deal with large quantities of these pollutants. Researchers from the Louisiana State Univ-ersity’s Hammond Research Station in the US created a system of floating wetlands in a storm water treatment pond while simulating the conditions in a lab. Ornamental and wetland plants were used. The system was filled with a nutrient solution that contained nitrogen and phosphorous concentrations of 11.3 and 3.1 mg/litre, respectively. The team found that canna consumed the most water and absorbed nearly 99 per cent of nitrogen and 92 per cent of the phosphorous in the pond compared to iris (Iris pseudacorus), another ornamental, that absorbed just 32 per cent of nitrogen and 38 per cent of phosphorus. Arrow arum, a wetland plant, removed 32 per cent of nitrogen and 26 per cent of phosphorus. 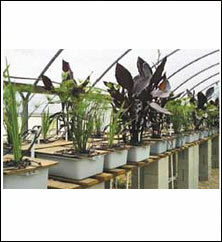 The results were published in the December issue of HortScience. The authors said that as canna allocates the majority of its biomass to shoots, regular harvesting can effectively remove the pollutants from water. The team suggests more research should be carried out to evaluate the impact of the amount of pollutant in water, density of the plant and frequency of harvest on the cleaning abilities of the plant.